Sebastian Mallaby is the Paul A. Volcker Senior Fellow for International Economic Relations at the Council on Foreign Relations. One can be sure, then, that his new comprehensive book, The Man Who Knew: The Life and Times of Alan Greenspan, reflects an Establishment point of view. As if this were not enough to tell us where the book is coming from, Mallaby informs us that he had Greenspan’s full cooperation in writing it. “This book is based on almost unlimited access to Alan Greenspan, his papers, and his colleagues and friends, all of whom were generous in their collaboration. Though the book is hardly a panegyric to Greenspan, Mallaby views his subject with considerable favor. Nevertheless, the book contains ample material for a more severe verdict: Greenspan abandoned the free market convictions he effectively defended early in his career as an economist. 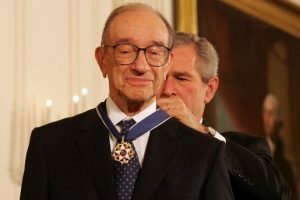 To uphold economic truth was not the path to the power and influence Greenspan sought; and he readily adjusted his beliefs to fit with his ambitions. Nor was this the only area where Greenspan adopted a radically free-market stance. Defying the mainstream, “Greenspan followed up with an attack on government efforts to rein in monopolies with antitrust laws. … He pointed out that it was not just corporate managers who would want to challenge monopolists; the financial system would demand that they do so. If a monopoly extracted fat rents from its customers, its share prices would soar; that would give entrepreneurs an incentive to create rivals to the monopoly, and it would give financiers an incentive to ply those rivals with abundant capital.” Mallaby views this “crude” view with evident distaste, noting that both Friedrich Hayek and Milton Friedman adopted a more “nuanced” position. What then became of this free-market radical? Unfortunately, his desire for “power and pelf,” in Murray Rothbard’s phrase, led him to alter his views. A firm commitment to freedom would never gain him entry to the inner sanctum of government, and Greenspan soon learned to temper his views. Greenspan wanted to fight inflation; but the best way to do it was no longer acceptable. A gold standard, he had long ago recognized, would bring with it monetary stability; but to replace the Fed with a commodity standard not subject to control by the government would erode his power. Accordingly the gold standard had to go. He cast aside the gold standard with a transparent sophism: “A necessary condition of returning to a gold standard is the financial environment which the gold standard itself is presumed to create. … But, if we restore financial stability, what purpose is then served by a return to a gold standard?” (quoting Greenspan). Why a gold standard cannot help create a stable financial environment, but instead presupposes it, Greenspan left unclear. Even less clear was how the Fed was supposed to preserve stability in the absence of the gold standard. Evidently we were to rely on his supreme powers of judgment in steering the economy. Greenspan in his long career as Fed chairman gained the power and acclaim he coveted; but the crash of 2008, two years after the end of his tenure in office, led to a sharp decline in his reputation.